When originally published in 1959, this marvelous collection of dog stories compiled by the late humorist Corey Ford was an immediate bestseller. For this edition, Ford selected pieces written by his friends and peers whose names appeared on the mastheads of The New Yorker, Vanity Fair, Life, and Colliers, including such greats as Thurber, Benchley, Wodehouse, White, Woollcott, and Marquis. Ford also provided balance with stories from Steinbeck, Lardner, Lawrence and others, including his own superbly poignant, original version of his classic short, The Road to Tinkhamtown. 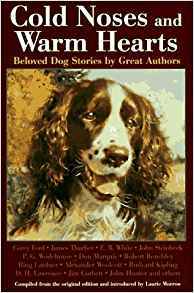 All the stories in Cold Noses and Warm Hearts share the same theme, whether underscored by humor or deep emotion: the strong, enigmatic bond between dog and master. Laurie Morrow is the official biographer of Dartmouth College, Corey Ford Archives, and is a frequent contributor to many national dog and sporting magazines.